The Essentials by OFM seating Collection is where quality meets value. 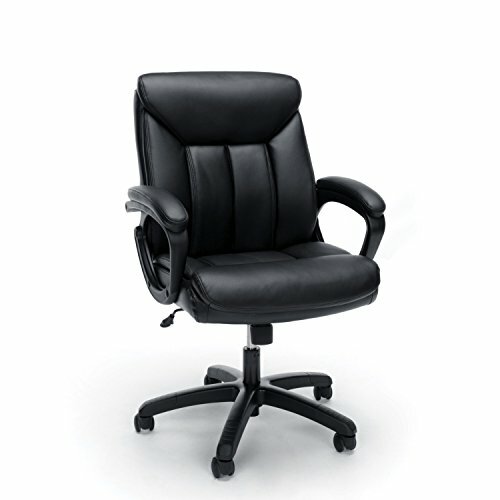 The ess-6020 office chair features luxurious Softhead leather for an upscale look and feel, making it a SMART and stylish solution for any application. The back and Seat are designed with segmented padding providing total body support, and the back also features recessed lumbar cradling for exceptional comfort. The chair offers simple and intuitive controls such as Pneumatic Seat height adjustment, 360 degree swivel, tilt tension and tilt lock for added customizability and comfort. The padded fixed loop arms provide additional support. The comfort, stylish look, and price point of this chair make it a perfect addition to the office, whether at work or at home. This chair meets or exceeds industry standards for safety and durability, and is backed by our Essentials by OFM limited lifetime warranty.